The moment has come to 'hand' out your first Hi5 (see what we did there?) - follow these easy steps! Every week (at midnight on Sunday, to be exact! ), you get a fresh batch of 5xHi5's to give to your co-workers. You will see all the Hi5's in your company on the Hi5 Wall of Fame. 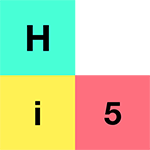 Click on the Give a Hi5 icon on your Hi5 menu, or on the pink hand icon in the bottom right corner of your screen. To find the person you want to Hi5, scroll through the list of your co-workers, or type their name into the Search for co-workers field. Click on their name to get started with your Hi5. Note: You can only Hi5 co-workers who have activated their accounts. If you can't see their name on the list, let them know that their account may still be inactive, or ask the Admin to check. Fill in the blank box with your awe-inspiring Hi5. This is where it gets really fun! We've added plenty of elements to help you express yourself: add emoji's to your message, upload a Photo, GIF or choose a Giphy. You can also Hi5 a team by tagging co-workers. If you need a little inspiration, we've provided some recognition tips on the right. You can also click on the Recognition Suggestion button to get some helpful suggestions on how to get your Hi5 started. Once you've filled in the content of your Hi5, choose the relevant Company Values, if applicable. Click Send Hi5. If you're satisfied with your Hi5, click YES when the confirmation pop-up appears. To see your Hi5, as well as all the others given in your company, go to the Hi5 Wall of Fame. If you have uploaded your own GIF, and it isn’t moving on the Hi5 Wall of fame, you have most likely saved it as an image. Delete your Hi5 and make sure you upload your GIF by clicking the GIF button. Check out this article to learn how to back Hi5's given by others in your company. Or delight multiple co-workers at once without using up your whole week's Hi5's - simply Hi5 them as a team!